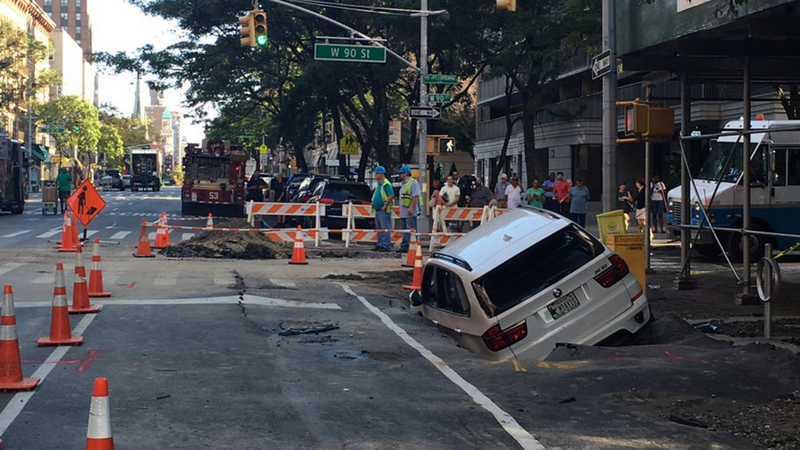 Here’s a bit of schadenfreude for those of us who can’t afford to breathe in New York’s Upper West Side: A water main break last night created a sinkhole, and that sinkhole swallow an entire BMW worth around $55,000*. DNAinfo reports that the break began around 9:15pm last night, while NBC reports the water flow was finally rerouted over two hours later. Just enough time for the sidewalk to start moonlighting as quicksand. Besides sending an SUV back into the loam, the burst main also left apartments in the area—many which sell for millions of dollars—with dirty brown water, or no water at all. Basements in surrounding high rises had up to 6 feet of water in them, presumably destroying whatever had previous been stored there. The New York Fire Department has no idea how many gallons of water spilled out, what caused the break, or when repairs will be complete. No one was injured in the break, but that guy’s car is probably totally fucked.